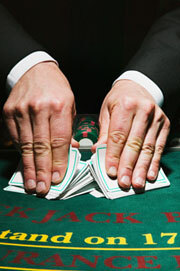 The most common gamblers' mistake is incomplete understanding of the game rules and basic strategy. Don't start the playing activity without thorough understanding of the rules. For example, you can lose a lot of money if you'll place too much bets in craps game. It is necessary to understand games odds, house edge and payout structure too. Casino gamblers very often forget to manage their bankroll, although it plays the most important role in the playing process. Players with small money amount usually place too high wagers and lose everything they have. Another players' mistake is chasing losses. Usually when gamblers lose for a long period of time, they make more mistakes and place more unfortunate wagers. The unspoken casino rule states: the more time gambler spends at the particular game, the more likely he/she is to lose. Usually casino gamblers make stupid mistakes when they win too. They become too excited with the game and forget to think over their actions. Their greediness leads to loses and even to failure. It is not a secret that using of the alcohol and drugs can't lead to something good. The casino gambling activities are not the exception. To avoid playing mistakes it is important to have sharp mind and attention, otherwise you'll be unable to make intelligent decisions. Don't sit at the playing table too long, because you can lose your attention and exhaust yourself. To have the clear mind and not to make costly playing errors, make some breaks while playing. One more gamblers' mistake is that they fail to use casino cards and bonus offers. Usually these offers are available to regular players, but the novice gamblers have a great opportunity to get some of them and increase their winning chances. It is necessary to remember: luck is for losers! Don't hope only on good fortune - use your mental skills while playing. Learn rules and strategy of the game perfectly and only than start your gambling process. There is no doubt the roulette is the most popular casino game in the world. But usually gamblers make too much mistakes while standing at the roulette wheel. We offer to your attention the most common fallacies to avoid them and increase your winning odds. Many players believe that the roulette numbers appear in the particular order and they always try to trace it. But there doesn't the pattern according to which the numbers are picked. Remember that during the complete 38-spins cycle there will be 24 picked numbers. This fact means that some numbers can appear more often, so use in your winning strategy.